Spectacular island and overwhelming service. This tour deserves more than 5 stars. Super beautiful islands with crystal clear blue water and big rocks structures. They cover 2 islands and 2 snorkling points. Beautiful fishes and corals under water. Awesome service by Seastar. The Staff/Guides were so humble, helpful and caring. They provide Breakfast, lunch and evening snacks. Additionaly serve fruits, cold drinks, biscuits, chocolates etc throughout the tour. Very well managed tour. Even though the travel time to this island is more, I would like to visit again and will definetely recommend to others. Thank you Klook for arranging such a wonderful tour. 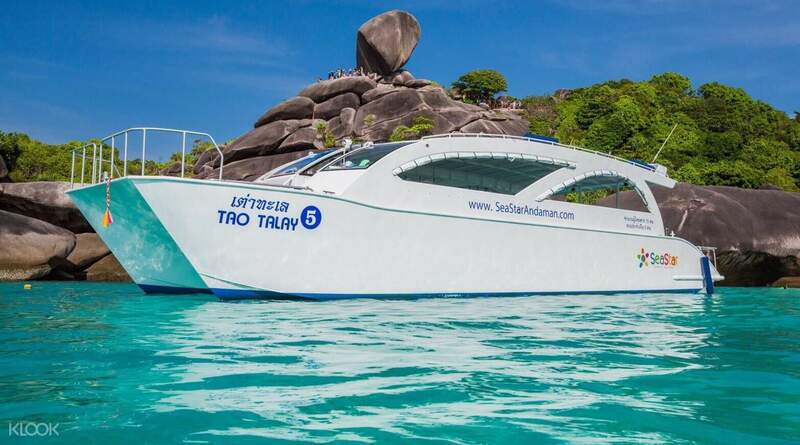 Arrive in paradise as you embark on this journey that will take you to the wonders and breathtaking beauty of Similan archipelago in Phuket. Your adventure will kick off with a convenient and comfortable hotel transfer service that will take you to Seastar’s private pier. 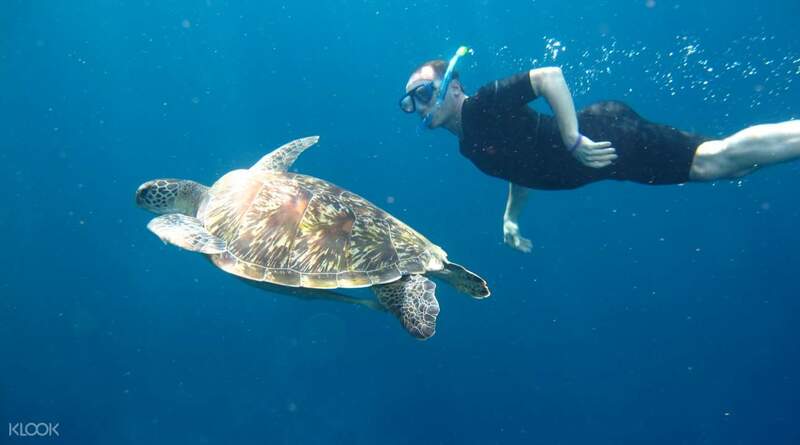 Once you reach the islands, colorful marine life will welcome you as you snorkel through the crystal clear waters. Relax and take perfect vacation photos as you make your second pit stop in Princess Bay. In time for lunch, a Thai buffet will be served to you while you enjoy the surrounding blue water and sky of the archipelago. Located at the northwest ridge of Island 9 (Koh Ba-Ngu), Christmas Point boasts a spectacular arrangement of underwater boulders and a tall coral sea fan that appear to have been placed by some mystical creature. To cap off the day of fun and adventure, this tour will take you to its landmark, the Sailing Rock. Great experience. Fantastic arrangements by the tour operator. A well organised tour with mesmerising experience of similan island marine life, enjoyed snorkling and relaxing on the soft white sand beach. Very clear water and not so crowded. Great experience. Fantastic arrangements by the tour operator. A well organised tour with mesmerising experience of similan island marine life, enjoyed snorkling and relaxing on the soft white sand beach. Very clear water and not so crowded. Spectacular island and overwhelming service. This tour deserves more than 5 stars. Super beautiful islands with crystal clear blue water and big rocks structures. They cover 2 islands and 2 snorkling points. Beautiful fishes and corals under water. Awesome service by Seastar. The Staff/Guides were so humble, helpful and caring. They provide Breakfast, lunch and evening snacks. Additionaly serve fruits, cold drinks, biscuits, chocolates etc throughout the tour. Very well managed tour. Even though the travel time to this island is more, I would like to visit again and will definetely recommend to others. Thank you Klook for arranging such a wonderful tour. Spectacular island and overwhelming service. This tour deserves more than 5 stars. Super beautiful islands with crystal clear blue water and big rocks structures. They cover 2 islands and 2 snorkling points. Beautiful fishes and corals under water. Awesome service by Seastar. The Staff/Guides were so humble, helpful and caring. They provide Breakfast, lunch and evening snacks. Additionaly serve fruits, cold drinks, biscuits, chocolates etc throughout the tour. Very well managed tour. Even though the travel time to this island is more, I would like to visit again and will definetely recommend to others. Thank you Klook for arranging such a wonderful tour. This package is the best-ever service so far from all the packages I booked through Klook. Even though there are some unpleasant incident happened during the voucher confirmation. This Seastar company deserves a 5-stars badge, the service is professional, wonderful and each helper are very polite/professional and very attentive to ensure each one onboard is being taking care properly and feel at home, i.e. seasick pills are distributed, foods are sufficiently distributed by staffs. Will definately recommend my friends. This package is the best-ever service so far from all the packages I booked through Klook. Even though there are some unpleasant incident happened during the voucher confirmation. 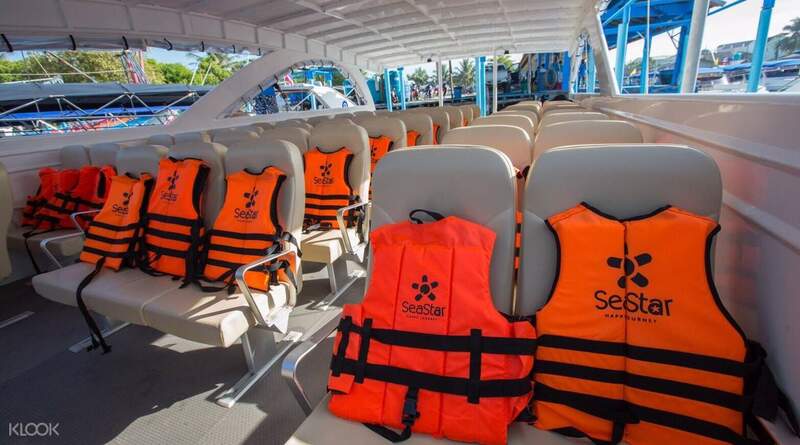 This Seastar company deserves a 5-stars badge, the service is professional, wonderful and each helper are very polite/professional and very attentive to ensure each one onboard is being taking care properly and feel at home, i.e. seasick pills are distributed, foods are sufficiently distributed by staffs. Will definately recommend my friends. The Similan islands are beautiful-- white beaches, blue waters, and a variety of fish to be seen. SeaStar (the operator) is great: very comfortable catamaran, caring staffs, and neatly packed lunches. However, there are way too many tourists. Also the composition of the tourists is skewed towards Chinese. Be prepared to hear yelling and other noises when on beach and when snorkeling. To us, this made the beautiful Similan beaches felt almost like Patong. The Similan islands are beautiful-- white beaches, blue waters, and a variety of fish to be seen. SeaStar (the operator) is great: very comfortable catamaran, caring staffs, and neatly packed lunches. However, there are way too many tourists. Also the composition of the tourists is skewed towards Chinese. Be prepared to hear yelling and other noises when on beach and when snorkeling. To us, this made the beautiful Similan beaches felt almost like Patong.